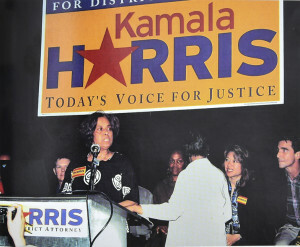 Kamala during one of her campaigns. A few weeks ago, when Kamala Harris, an African-American her entry into the 2020 US presidential race, there was a lot of excitement in India, because of her India/Chennai connection. When she was firstsworn in as a Democratic senator from California in 2017, she became only the second African-American woman to serve in the Senate. Kamala was also the first woman elected as District Attorney of San Francisco and the first person of South Asian descent to become Attorney General of California. Those are just a few of her inspiring firsts. But this article is not about her achievements but about her India/Chennai connection. As a child, Kamala frequently visited her extended family in the Besant Nagar neighbourhood of Chennai, where her grandfather had settled down post retirement.. Kamala grew up going to both a black Baptist church and a Hindu temple. [She has one younger sister, Maya, a former Vice-President at Ford Foundation who was a part of Hillary Clinton’s election campaign. Kamala and Maya, were raised by their Indian mother, in a black neighbourhood during the Civil Rights movement, which helped shape Kamala’s African American identity. It seems was a very strong woman, very hardworking, very intelligent. After doing her graduation in home science in Delhi, she went to America for higher studies in 1957-58. She got her Masters and a Ph.D. Later she became a scientist who worked on breast cancer. She met Dr. Donald Harris, a Jamaican American and married him in 1963. Kamala was born in 1964, the first grandchild in the family. Kamala’s parents divorced when she was seven, and her mother was granted custody of the children by court-ordered settlement. (After the divorce, her mother moved with the children to Montreal, Québec, Canada before returning to USA to pursue a career in cancer research. 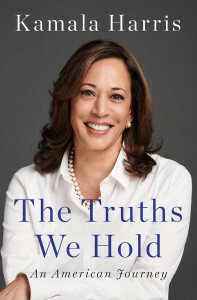 Kamala graduated from Montreal’s Westmount High School in Québec after which she attended Howard University in Washington, D.C., where she majored in political science and economics. At Howard, Kamala was elected to the liberal arts student council as freshman class representative and was also a member of the debate team. She returned to California, where she earned her Juris Doctor (J.D.) from the University of California, Hastings College of the Law, in 1989. She was admitted to the State Bar of California in 1990. Thus began a legal career in which she was to excel in whatever job she undertook and become a trailblazer. Though Kamala was born and brought up in America, her mother Shyamala had inculcated in her South Indian culture and values. Shyamala was a true South Indian in all aspects and loved South Indian food. That is why her daughters also like South Indian food. Kamala believes in going to the temple because her mother believed in it. According to her extended family in Chennai, Kamala is what she is today because of her mother. Kamala married Douglas Emhoff, a Jewish attorney from Los Angeles, a few years ago at the age of 49. This was her first marriage while he has two kids from his previous marriage. The extended family from Chennai was there to celebrate the day. As she got married to a Jewish American who is also a lawyer, there was a Jewish ceremony as well as an Indian ceremony with mangalsutra etc. The wedding was a family affair with her close family and friends attending it. There was special vegetarian food for the guests from India at the feast as Kamala knew that her family members from India ate only vegetarian food. So Dr. Sarala Gopalan, her mother’s younger sister who is a consultant at Voluntary Health Services in Chennai, broke 108 coconuts at the Ganesha temple where Kamala’s mother had once been a committee member when it was first set up. Dubbed as the ”female Obama”, the press is already touting her as the potential first woman President for the 2020 election. If she becomes a leading contender for Democrat presidential nominee she may once again choose to foreground her black identity to appeal to the coalition that voted Obama to power. Let us wish Kamala Harris, with her family’s roots in Chennai, all the best in her dream of becoming the First ‘Indian-African-American’ Woman President of USA.